Caterpillar has showed a new CT660 vocational truck in Las Vegas, Nevada, which will be a part of future big range of vocations. The set-back axle (SBA) Caterpillar CT660 was unveiled to industry journalists prior to Conexpo-Con/Agg on Sunday and surprisingly, it was painted viper red, a departure from Caterpillar's trademark yellow and black. The new truck was also significantly different in appearance than the International PayStar it was based on. 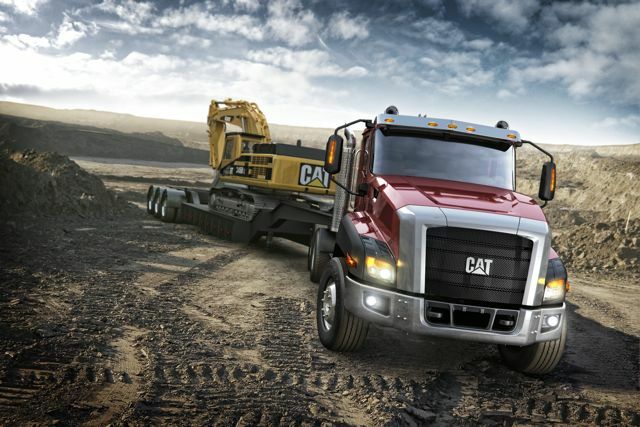 And it is differed from Australian Caterpillar CT610/630 models, which are more looks like International. "To say everything above the frame rail is new is a fair statement," said Gary Blood, product manager, vocational trucks. "There is very little carryover inside the interior. We even did things like, we didn't like how the window lift worked so there are now two window lifts per door." Attention to detail was the theme during the CT660's design process, which included heavy consultation with customers. The tired wood grain paneling so often found on truck dashes has been replaced with brushed aluminum, giving the interior a modern look. Cat also integrated the speedometer and the tach into a single gauge to better utilize dash space. The glove box has been replaced with a removable storage bin.